A dental crown is a type of dental restoration that completely covers up and protects the remnants of a tooth or dental implant post. Such a restoration is necessary and recommended when a big cavity destroys a large part of a tooth and leaves it where it could easily fracture if it was filled instead. With a dental crown, a dentist can restore the strength and shape of the tooth and provide a cosmetically appealing tooth-like appearance. Stainless steel. 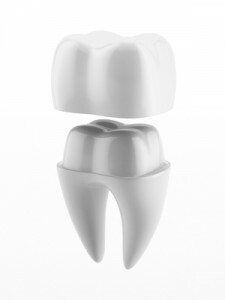 Used for short-term restoration, stainless steel crowns are metal shells that come pre-formed. They are usually used on primary teeth in children or as temporary while a permanent crown is being fabricated. They adequately protect the tooth or underlying filling while a better crown is made from a superior material. For children’s baby teeth, a stainless steel crown may be used to fit over a tooth to protect it from breaking down further and to hold the space while permanent teeth grow in. In this situation, the primary tooth will fall out naturally, and the stainless steel crown will come with it. Metal Alloy. Made from gold and other precious alloys like platinum or palladium and a base metal that’s non-precious like chromium or nickel, these can vary in hardness and in strength. Gold crowns are the easiest to fit, but they’re also the softest. When non-precious metals are used, the underlying tooth can become black as metal leaches into the tooth. This can also cause a metallic taste. One advantage of metal alloy crowns is that they can be made to be very thin and therefore preserve as much of the natural tooth underneath as possible. And since metal crowns aren’t as hard as porcelain, they don’t cause as much wear on surrounding teeth. They don’t look like natural teeth, however. Porcelain Fused To Metal or PFM. The most common and widely used of all dental crowns, these have the underlying strength of metal as well as the beauty of porcelain. Either precious or non-precious metals or some combination can be used. They can be made to exactly match the coloring of surrounding natural teeth or other restorations. Porcelain will cause wear on surrounding teeth, however, and the porcelain can chip or crack with age and wear. Also, a dark line can become visible at the gum line as the gums recede away from the crown. This can become a cosmetic issue if the crown is on a front tooth. All Ceramic, All Porcelain or All Resin. The best looking crowns available, these all-one-material crowns look more natural than any other type. And since there’s no metal, they’re safer and not a problem for patients with metal allergies. In many cases, they’re not quite as strong as dental crowns that include metal, however. They also wear down opposing teeth more than metal crowns, but there’s never a telltale black line since there’s no metal underneath to show. When a crown is on a front tooth, this is the best and highest-quality choice. Now that you know more about dental crown materials, you’re better prepared to make a smart choice for your restoration needs.